Since I started intuitive eating back in April, I’ve had some “rules” (more like guidelines) for my eating habits. These help me focus on my athletic performance and remind me what helps me feel best throughout the day. I thought it would be interesting to share these with all of you since I’m sure many of you have found these things also help you perform better! The first thing I drink in the morning is not coffee (but that comes as a quick second drink). Instead, the first thing I drink is two glasses of water! Besides the fact that hot coffee isn’t the greatest thing to take vitamins with, drinking two glasses of water helps me get a dent in my 100+ oz water goal each day. I’ve been doing this for a couple of years so it’s become second nature to pour myself a glass, drink and refill while I’m making breakfast each morning. Now it throws me off when I travel and don’t have my water to drink right away! This is one thing I’m still struggling with, finding the balance between having treats and not feeling guilty. I normally do pretty good since I use my post-workout smoothie/protein cake as my treat for the day (by adding in peanut butter, coconut flakes or chocolate chips). But where I'm still struggling is with treats in the office and the mental aspect of eating things that when I was counting macros, I “couldn’t” eat because it didn’t fit in. So now I’m working on not feeling guilty if I have some but not having so much that I don’t eat the more nutritionally dense foods I’ve brought in. I recently did a whole post about what I eat before I workout and why. It really comes down to how hard I’m working out, what kind of workout I’m doing and when it is. 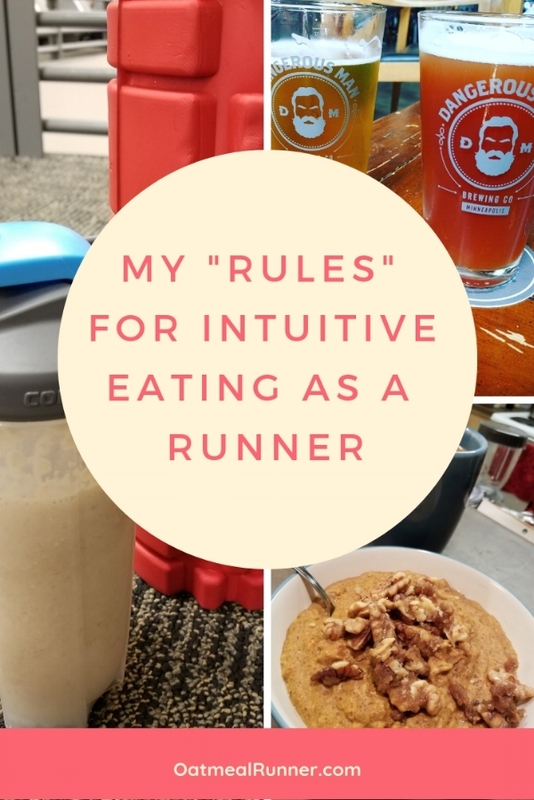 But I feel like it’s taken a lot of trial and error (plus moving into intuitive eating) to make me aware of what fuels my performances the best. I used to be on the “I must have a ton of protein after every workout” bandwagon. But now I’m feeling that, when it comes to my workouts and my body, that it’s more important for me to get carbs in after a run than anything else. If I’ve had an easy run day, I might not even eat right away because my body didn’t burn that many calories. I still do try to get in a balanced snack/meal (depending on what kind of workout I’ve done and what time of day it is) within 60-90 minutes of working out. But that normally ends up being my usual dinner or lunch time anyways because of when I’m working out. So I usually end up either cooking a meal (and having a protein treat later) or having a more calorie dense smoothie or smoothie bowl for my meal (aka adding in the peanut butter or coconut flakes in). Vegetables used to be the hardest thing for me to get in. I love vegetables but i just never made much of an effort to actually eat them. So when I started intuitive eating, I made one of my goals to increase the amount of vegetables I was eating in a day. And now I find myself reaching for vegetables to add in more than anything else (that’s not peanut butter...sorry not sorry). At a minimum, I have one serving at lunch, dinner and any protein smoothies I’m having and my morning oatmeal usually has a fruit or vegetable in it. This is the one thing I’ve keep a pretty consistent guideline from my macro counting days into my intuitive eating days is keeping the majority of my drinking to after my long run and only having one or two drinks. I just don't’ feel at my best when I do a hard workout the day after having a couple of drinks and I don’t sleep as great when I do have a drink. Of course, this guideline was also partially because i had more room for the “empty” calories of alcohol but the way drinking makes me feel while working out is still the same. Plus, a nice glass of beer or wine taste extra nice after a long run!